Narendra Modi, whose supporters boast of his physical prowess and indifference to sleep, has shared the secrets to his morning fitness regimen in a video where the Indian premier thrusts a staff, walks backwards and flexes over a boulder. Modi spruiked the "refreshing and rejuvenating" benefits of his exercise workout in a video posted online Wednesday that also included a meditative stroll over a special path "inspired" by nature. It follows a trend of homemade motivational fitness videos from prominent Indians, including adored cricket captain Virat Kohli, trying to tackle obesity and poor health in the country of 1.25 billion. In the latest addition Modi, 67, implores Indians to follow his example in a two-minute clip shot in the lush garden of his New Delhi residence. 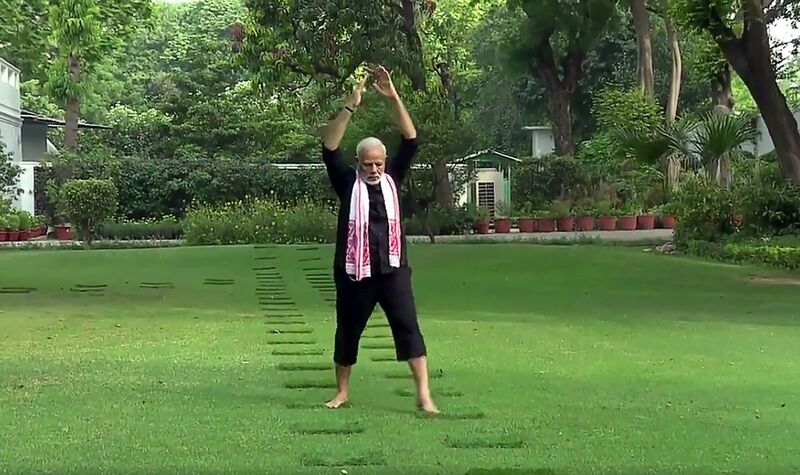 "Apart from yoga, I walk on a track inspired by the Panchtatvas or five elements of nature -- Prithvi (earth), Jal (water), Agni (fire), Vayu (air), Aakash (sky)," Modi says in the video viewed nearly 200,000 times within hours of being posted. "This is extremely refreshing and rejuvenating. I also practise breathing exercises." In one clip Modi, clad in a black tracksuit, walks backwards over a treaded lawn with his hands clasped in a prayer pose, before stretching over a large boulder. He then proceeds to a specially-designed path around a large tree, balancing on its edges before walking over pebbles, wood and water, as he pumps a wooden staff from side to side. The teetotal vegetarian then stands before a Buddha statue in his garden, breathing through one nostril. Later he sits on a rock, sharply taking quick breaths in a meditative pose. The sexagenarian premier claims he operates on little sleep and his devotees have bragged on his impressive physique, including most notably a rumoured 56-inch chest. 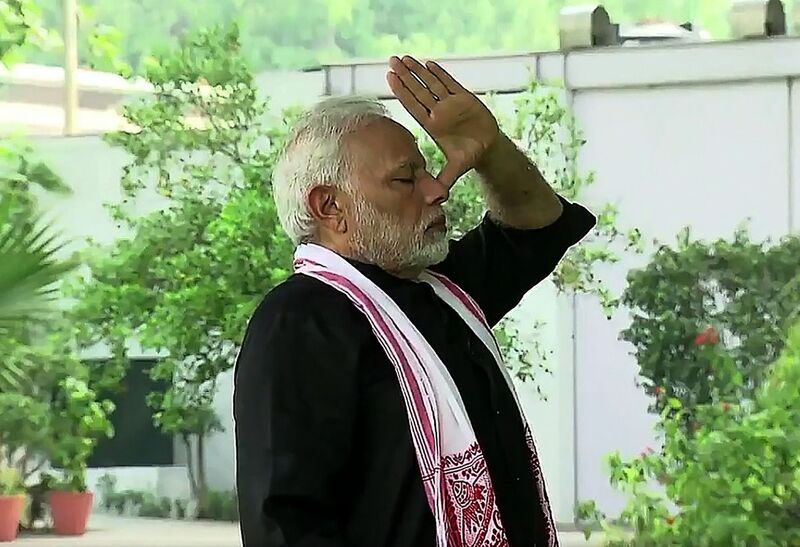 A passionate yoga enthusiast, Modi has also touted the benefits of the ancient Indian practice via a cartoon avatar of himself performing sun salutations and downward dogs. Government ministers were quick to heap praise on Modi for his "unparallelled energy levels". "Majority of middle-class citizens live amidst #stink from open defecation by #slumdwellers & smoke from waste burning & fuelwood," posted one Twitter user, Naresh Minocha. Despite the tranquillity depicted in Modi's backyard, experts often warn Indians against exercising outdoors in New Delhi and other major cities due to terrible air quality. Levels of harmful airborne pollutants in the capital reached 14 times the World Health Organisation safe level on Wednesday, according to the US Embassy website, as Modi's video went viral.